A little Christmas treat for you here, a sneak peek at the Deco line from Gaziano & Girling that will come out next year. The shots, taken exclusively by Andy for Permanent Style, are of the first finished model, a black whole cut. Deco is intended to be a hark back to the 1920s in terms of styling, with a longer last culminating in a subtly rounded toe. But more importantly, the waist is finished to a much higher standard than classic G&G shoes, being sewn by hand and cut closer, to create a rounded finish similar to bespoke. 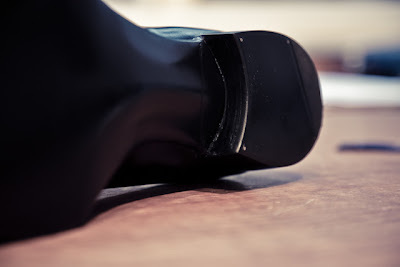 Traditionally this finish, with a rounded waist (high but not ridged like the fiddleback) coupled with a slimmer line to the foresole, is called a ‘spade’ waist as it is supposed to resemble the Ace of Spades. The waist and foresole are also edged by hand, and there is a long inside stiffener that would usually only be used on bespoke. After the waist, though, the most beautiful part is the pitched heel. This is cut by hand and, like a bespoke shoe, follows the curve of the heel cup. 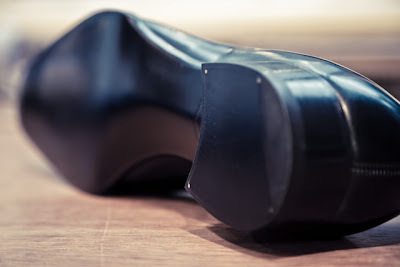 That pitch always looks both more attractive and more natural to me, unlike the straight, square lines of a normal heel. On the bottom the heel is also curved inwards towards the waist, accentuating the shape of the middle of the sole. 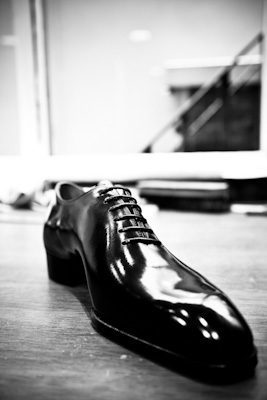 Deco shoes will be first seen at Pitti in January and will be available soon after. The price will be around £1000, similar to both Edward Green’s Top Drawer and the ready-to-wear Anthony Cleverley shoes. 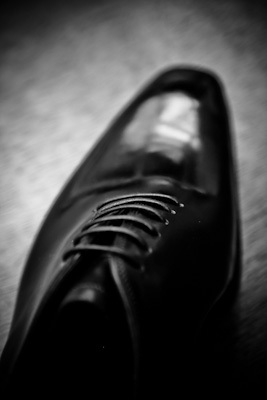 I can’t help feeling it’s a good sign for the industry if companies are launching such ultra high-end shoes. New, luxury ranges are normally driven by growing demand for the standard product. So these new shoes are nice to see – in both senses. You can follow the discussion on Sneak peek: Deco, from Gaziano & Girling by entering your email address in the box below. You will then receive an email every time a new comment is added. These will also contain a link to a page where you can stop the alerts, and remove all of your related data from the site. Love them. In the bottom picture they appear to have the recessed toe taps. Do they come as standard? I hope so. Wonderful. Thank you for sharing this. Should receive my next pair of G&Gs any day now. Beautiful shoe. Any ideas about HOW it can be bought when it appears? Not my style, nowhere to wear them anymore (retired) and too expensive for me, but Lord! that is one lush shoe! Wow, what a beautiful shoe! Great lines and a clean design!